What are the Best Movie Video Formats for Amazon Kindle Fire and Kindle Fire HD/HDX? Kindle Fire is a mini-type tablet computer designed and marketed by Amazon.com, derived from Kindle e-book reader (similar to B&N's Nook, Bookeen's Cybook and Aluratek's Libre). This first generation Kindle Fire has a 7-inch and a 8.9-inch display, 7.5×4.7×0.45 inches (191×119×11 mm), and then Kindle Fire HD and Kindle Fire HDX (7 and 8.9/8.99 inch versions) were also available in the 2nd and 3rd generations. Kindle Fire Content formats Supported: Kindle Format 8 (KF8), Kindle Mobi (.azw), TXT, PDF, unrestricted MOBI, PRC natively, Audible (Audible Enhanced (AA, AAX)), DOC, DOCX, JPEG, GIF, PNG, BMP, non-DRM AAC, MP3, MIDI, OGG, WAV, MP4, VP8. It is obvious that the best movie video formats for Kindle Fire are MP4 (with MPEG codec), M4V, Webm, 3GP and MKV, and for Kindle Fire HD and HDX MKV and MP4 (with H264 codec). Among them, MKV is the most common high definition video, MP4 and M4V are applied to Apple, both MP4 and WebM videos can be downloaded from YouTube, and 3GP/3G2 videos are used on 3G mobile phones yet playable on some 2G and 4G phones. And MP4 is highly recommended for its easy availability, high compatibility, great compression rate and especially amazing video quality. I want to copy my own videos to the kindle fire. I tried ripping it with handbrake to m4v an mp4. Neither has worked. Anyone know how to convert video for the fire? I've tried Handbrake and a few videos that were already in .mp4 format, but neither has worked. I think the specific codecs the Fire requires aren't that common. Anyone found a good conversion program that's been actually used? Not all the video files you have are in those formats supported by Kindle Fire (HD). Besides, Kindle Fire limits the vertical resolution to a maximum of 1080 pixels and the maximum frame rate to 30 frames per second. In such cases, you may need to convert video formats and change specifications for Kindle Fires (HD, HDX) with different dimensions. VideoProc is the best video converter for Kindle Fire. 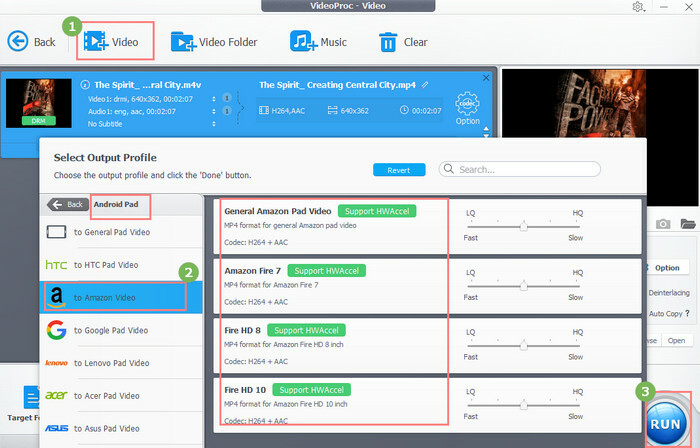 For one thing, it has abundant Amazon video profiles such that users do not have to make personal settings while getting the best output videos made for Kindle tablet; for another, this Kindle Fire HD video format converter also allows users to select and adjust aspect ratio, change CBR VBR bitrate and other video/audio parameters to get the most ideal output files for any portable device. All AVI, AVCHD (.mts, .m2ts), MPEG (.mpg, .mpeg), MOV, WMV, FLV, MOD, TOD, RM, RMVB, VOB, ASF, QT, DAT, Google TV and TS videos can be converted for playing on Kindle Fire. 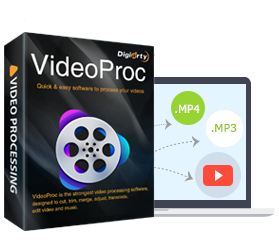 VideoProc - It can convert any videos for playback on Amazon Kindle Fire or many other devices at the fastest speed while keeping nearly lossless quality. Hundreds of premade presets allow you to convert video to MP4, AVI, MOV, Android tablets, smartphones, iTunes, iPhone, iPad, Windows Mobile, Xbox or other devices directly with Full Hardware Acceleration. Step 1. Download and launch the best Kindle Fire video converter on PC or Mac. Go to "Video" interface, and add source files by clicking the first button on the top left, or you can directly drag the originals. It supports importing videos in batch mode. Step 2. Click "Target Format" on the main interface. Under Movie Video Profile, find "Android Pad", click "to Amazon Video" and choose the most proper one among the options for reproducing in MPEG4/H.264 with different codecs for meet different demands of Kindle Fire users. This software enables you to preview the video on the right window of the UI. Step 3. Click RUN button to convert your AVI, AVCHD, MPEG, MOV, WMV, FLV, MOD, TOD, RM, VOB, ASF, QT, etc to the Fire. It means that you will get the Kindle Fire compatible video/movie file on your computer very shortly. Step 4. Attach the Fire to your computer via USB to load the output MP4 videos. The Kindle Fire acts like an external hard drive. Then drag & drop (or copy/paste) the video from the PC/Mac to the Fire. VideoProc (or for Mac) also supports converting HD/SD vide from one format to another, or to be friendly with iPad, Samsung Pad, HTC Pad, Google Pad, Lenovo Pad, Huawei Pad, Surface Tab and smartphones including iPhone 5S, Samsung Galaxy S5, Note 3, HTC One, WP8, as well as Xbox, PSP, PS3, PS4, etc. Another Tip: Kindle Fire (1st Generation) does not support HTTP Live Streaming (HLS). If you need to stream SD/HD movies to Kindle Fire, please try Air Playit. All in one: a video/audio/DVD converter, a video editor, a video compressor, a video recorder, and YouTube video downloader. part of you are prevented from playing some materials on Android caused by unacceptable formats. And here, we will give a thorough list of Android file formats. This page provides the answers of the best YouTube upload video formats, namely, the most suitable file extensions, resolution, file size and video formats supported. Wanna play DVD movies on Amazon Fire TV (Stick) connected HDTV for big screen visual enjoyment? Get the easiest way here! 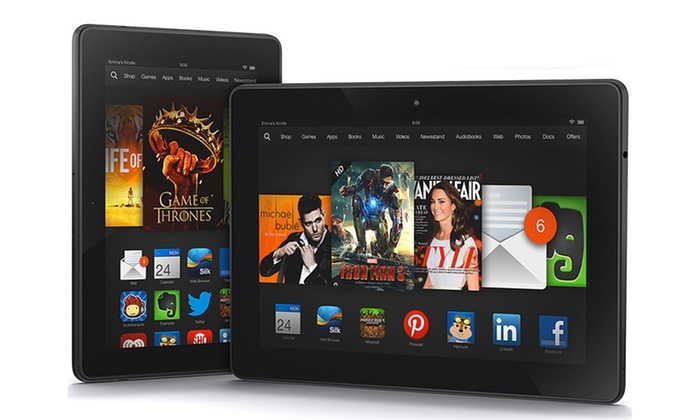 Part 1What are Kindle Fire and its dimensions? Part 2What are Kindle Fire supported movie/video formats? Part 3How to make your videos best for Kindle Fire?